As one reviewer noted, this mélange of zucchini and peppers with kasha is easy to make, great to nosh on and perfect on a salad or as a side. Mix kasha and egg white until well blended. Heat nonstick skillet on medium heat. Add kasha mixture; cook 3 minutes or until dry and grains have separated. Transfer kasha to small bowl; set aside. Melt butter in medium skillet with tight-fitting lid. Add onion and garlic; cook and stir 3 minutes or until crisp-tender. Add zucchini and peppers; cook and stir an additional 3 minutes. Add kasha, cumin and broth; mix well. Bring to boil; cover. Reduce heat to medium-low; simmer 10 minutes or until most of the liquid is absorbed. Let stand, covered, 10 minutes. Stir in cheese. Prepare as directed, substituting olive oil for the butter. 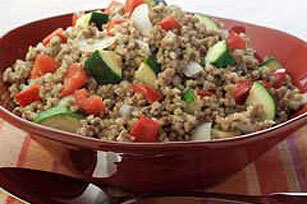 Substitute whole grain kasha for the coarse grain kasha. Increase the cooking time if necessary. Substitute vegetable broth for the chicken broth.